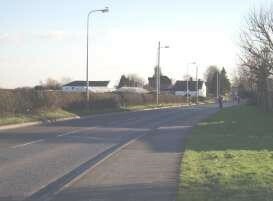 Swanlow Lane follows the top of the sandy ridge that projects south from the ancient borough of Over. The ridge has probably been a transport link for many hundreds of years, if not millennia. For the great majority of its time the area on either side of the lane was agricultural, with only a few houses standing along it. Only in comparatively recent times has a significant part of it become a populated area. Starting at Over Square, the lane continues through the southern part of Over before entering the township of Swanlow as it passes the ancient parish church of St. Chad’s and the Old Star public house. Just past the junction with Moors Lane the road forms a boundary with Darnhall. 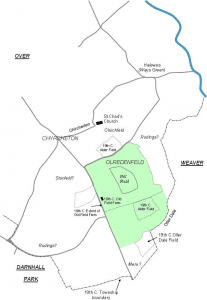 Then, at Court House Farm, it forms the division between the townships of Darnhall and Weaver before descending the bank, once known as Chivey Hill, to meet the Ashbrook. 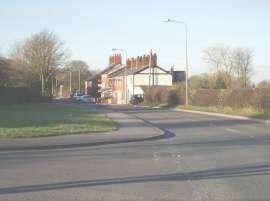 From here the road changes its name as it continues on towards Church Minshull and Nantwich. The name of the lane clearly refers to the road that leads from whichever direction towards and through the township of Swanlow. The place name ‘Swanlow’ first occurs in documentary evidence in the 1330s. Its name is certainly earlier than that. It derives from two elements swān and hlāw. The first is normally considered to mean ‘swine’, and thus a place where swine were kept or pastured or even a place where the herdsman lived. However, a more likely meaning is Swein, a Danish personal name, for example, Swein Forkbeard, a Danish king (d. 1014) who played a significant part in invading England and was the father of the famous King Cnut. This first element is coupled with hlāw, an Old English word meaning a small hill or mound, perhaps a burial mound – a tumulus, the site of a pre-Christian burial. A particularly interesting thought when one considers that St Chad’s churchyard, which lies a few hundred yards off the lane, has possible links with the pagan period. So it is quite possible that the name refers to a burial mound of a man named Swein, or, at the least, an area of land containing such a mound once owned by that person. This latter suggestion of place-name origin is also supported by the fact that many ‘low’ placenames are coupled with a personal name. Mounds of earth and stone were placed over a burial or cremation of a particular individual and may have been used by successive generations, taking the name of the last deceased. Often these funereal deposits were located on the boundaries of tribal estates and it is also a fact that many tumuli are located on high ground or in prominent positions to allow them to be seen from a distance. At Moulton, on the other side of the river Weaver, there was a Bronze Age bowl barrow about 150 yards north-east of Moulton Bank Farm which has now disappeared. Ormerod describes it as being on ‘the highest point of the ridge’ and ‘a tumulus of considerable elevation and an extraordinary large diameter’, but, unfortunately, as is so often the case due to centuries of farming – ploughing and the trampling of livestock – nothing remains of it today. The tumuli at Swanlow, if indeed there was one, would have fitted the usual model of being in a prominent position and close to a boundary. Whilst the name of the township occurs at an early period the actual lane is not mentioned until 1699. It is clearly marked on Burdett’s map of 1777 with a few cottages straddling the southern end of the lane. 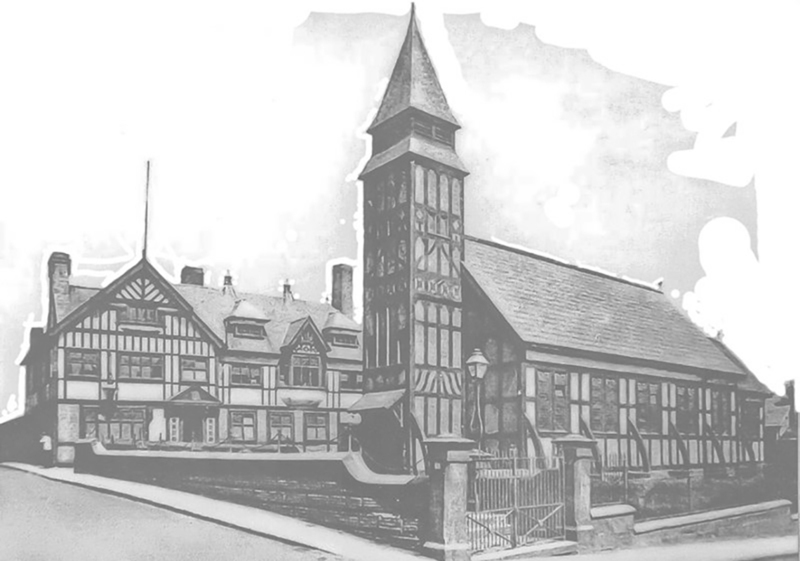 Swanlow’s early history is inextricably linked to that of the two manors of Over and Darnhall, though there is in fact little reference in the historical annals to the township itself. Swanlow was probably a township within the manor of Darnhall which originally included the church of St Chad’s. During the late 13th century the two manors were granted by Prince Edward (later Edward I) to the abbey he had founded at Darnhall which later transferred to Vale Royal. In the mid-fourteenth century the Swanlow area was more populated then than it was in the middle decades of the last century. The significant fact was that along Swanlow Lane, in the vicinity of the cross roads with Darnhall Lane and the driveway to St. Chad’s church, there were numerous cottages that comprised the hamlet of Chyrcheton (‘Churchtown’). In addition there were a few dwellings in Mers (‘the boundary’) which probably lay at the far end of Swanlow Lane close by the boundary with Weaver, and several in Rudings (the clearings – areas of land cleared from the waste for cultivation). Swanlow itself is mentioned at this time as the site of a few houses or ‘messuages’. A great deal is known about people living in these parts during the 14th century due to the existence of a rental of abbey property in the Vale Royal Ledger Book. The original account of the history and administration of the Cistercian Abbey has been lost for hundreds of years, but was transcribed in 1662 by Randle Holme and is now preserved in the British Library. From this the Record Society of Lancashire and Cheshire published a printed version in 1914. Other documentary sources, such as leases of property, also exist, allowing us to build a picture of Swanlow through time. For the Tudor period there exists a muster list, that is, a list of able-bodied men for military service which contains many surnames that survive today. Numerous court rolls of the 17th century provide lists of residents and there are many surviving wills of local people. Where exactly is or was Swanlow? Clearly, throughout history, people have known of a place called Swanlow, so where was it? We have no way of knowing, but allow me to speculate. One of the largest fields of medieval times was ‘Olredenfeld’ – the alder tree valley field. As agricultural practices changed, this field became enclosed to form several smaller fields and crofts, one of which in the very centre is of particular significance. Much of the land became Old Field Farm and according to old maps, in the centre of the Old Field Farm estate there was a field with a curving boundary along which ran a footpath: a path that deviated to follow the curve from its otherwise straight course from Mers and the township of Weaver towards St Chad’s – was the path skirting a feature in the landscape? 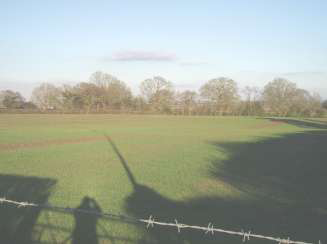 The early plans and aerial photographs show this field to be almost oval in shape with a north-south orientation. In the 1840s this was known as ‘Hill Field’: a strange name for a relatively flat piece of land. (See sketch map below) Was there at one time a small hill here which has over the years been ploughed out – a mound? If so was this the ‘low’? Its location in the very heart of the Swanlow district would make sense. Hill Field, off Swanlow Lane.